We have great news for all those aspirants who are eagerly seeking for the BECIL Patient Care Manager Recruitment 2018. Here, in this article, we are going to provide all the detailed information regarding the BECIL Vacancy 2018 in the below sections of the post. The Interested & eligible Aspirants must read the full article & get all the relevant details before applying for the given post from the official portal of the Broadcast Engineering Consultants India Limited that is www.becil.com. For more details, you can check our careerjobs360 web page on regular basis & get all the latest updates from here & stay in touch with us. 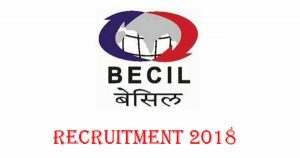 Broadcast Engineering Consultants India Limited has broadcasted the official advertisement for BECIL Vacancy 2018 intend to hire the eligible and efficient candidates on 131 Posts in the department. The names of the vacancies available in the department are Patient Care Coordinator, Patient Care Manager Posts. The Broadcast Engineering Consultants India Limited is hiring talented and deserving aspirants for the vacant positions. The contenders can apply for the BECIL Patient Care Coordinator Recruitment 2018 through the offline mode of application. The aspirants can get the BECIL Application form 2018 from the official website of the BECIL department on or before the last date that is 9th April 2018. For more details related to the BECIL Notification 2018 such as Academic Qualification, Age Limit, Age Relaxation, Application Form Fees, Important dates, Selection Criteria and how to apply for the recruitment is given below. The candidates must grab all the relevant details just by reading this post. For Patient Care Manager Post: Candidates must have possessed Bachelors Degree in Life Sciences with full-time Post Graduate Qualification in Hospital (or Healthcare) Management from Government Recognized board/University or Institution. For Patient Care Coordinator Post: Candidates must have possessed Full-Time Bachelors Degree in Life Sciences (preferred) or Bachelors Degree in any field from any Recognized board/University or Institution. Patient Care Manager: maximum age limit is 40 years. Patient Care Coordinator: maximum age limit is 35 Yrs. Age Relaxation: The relaxation in age will be given only to reserved category as per the rules and regulations of the government. Application Fees: The Registration form fee of Rs.300/- (Rupees Three Hundred Only) will be taken at the time of interview by Card/Cash. The SC/ST/PC aspirants no need to exempted pay registration form fee. Selection Procedure: The participants will be selected on the basis of their performance in the Personal Interview. Contenders who are willing to apply for the BECIL Patient Care Coordinator Jobs 2018 then they must know the eligibility criteria. Those contenders satisfy the eligibility needs then they may apply offline for the recruitment from the official portal of the organization. Contestant must apply online on or before the deadline date that is 9th April 2018. Here we have mentioned some necessary steps to apply for the BECIL Vacancy 2018. Then, on the homepage search out the BECIL Patient Care Manager Recruitment 2018 Notification and open it in the next tab. Then fill the application form without making any error. Attach the entire required document with it. Paste the photograph and signature on the application form. Now, submit the application form on the given postal address. Remit the application form Fee if required.